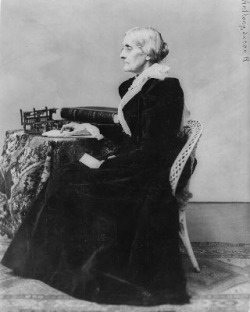 Susan B. Anthony was born in Adams, Massachusetts, in 1820. Daniel and Lucy Anthony were her parents. She was a member of the Quaker Religion. Her parents were very strict. She was not allowed to play with toys. Susan was a very smart child. She learned to read when she was only 3 years old. Her dad wanted his children to do well in life. Susan and her family moved to New York in 1826. She started school there. The teachers would not teach her how to do long division, because she was a girl. Her dad started teaching her in their house. Susan was a teahcer for ten years. When she stopped teaching, she started going to meetings. During these meetings people would talk about the temperance movement. Susan B. Anthony did not think people should drink alcohol. Susan’s father was an abolitionist. 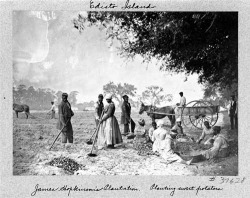 She and her father thought it was wrong for people to own slaves. When she was 16, she collected two boxes of letters from people who were against slavery. Susan lived at a time where women didn’t have equal rights. They did not have the right to vote. Susan’s mother and father thought women should have the same rights as men. 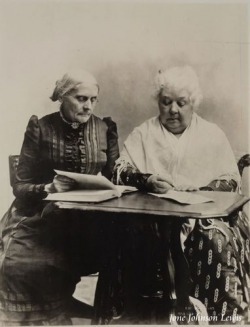 In 1851, Susan met Elizabeth Cady Stanton. The two of them became friends and started working together. They fought for suffrage, a woman's right to vote. They worked with each other and stayed friends all of their lives. Susan realized that women’s opinions would only be heard if they had the right to vote. Anthony and Stanton formed groups. These groups talked about how women needed to be able to vote. Stanton wrote the speeches that Anthony gave. 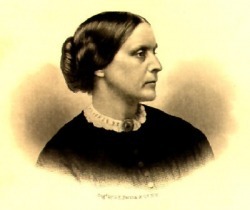 In 1872, Susan B. Anthony took a group of people into a poling place and tried to vote. She was arrested and was fined $100 dollars. Susan didn’t pay the fine. 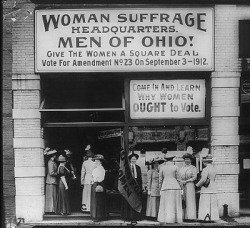 In 1920 the Nineteenth Amendment gave women the right to vote. In 1906 Susan died and didn’t get to see women get the right to vote. Women were supposed to be the keeper of the house. During Susan’s life 95% of women stayed at home. Women did not have much contact with other people, because they stayed in their homes most of the times. Literature that women read during this time was filled with cooking and cleaning tips. -Susan B. Anthony hated the color yellow. -Susan B. Anthony was pictured on the $1 coin, but was replaced by Sacagawea. -She gave her life insurance to the University of Rochester. This money was to pay for women to go to college.